California's historic drought has lots of gardeners searching for drought-tolerant plants. But what, exactly, makes a plant drought-tolerant? The term is a “catch-all to describe using plants that use less water,” Flora Grubb, the owner of a San Francisco garden store, explained on Forum. Falling into that "catch-all" category are plants that have evolved different physiological strategies to survive the dry times in California. Some drought-tolerant plants use trichomes, or tiny hairs, to grab water and hold onto it. These hairs reduce air flow over the leaves of the plant, reducing evaporation. Plants that are native to foggy coastal regions use trichomes to pull water from the air. Some plants can get half of all their water this way. 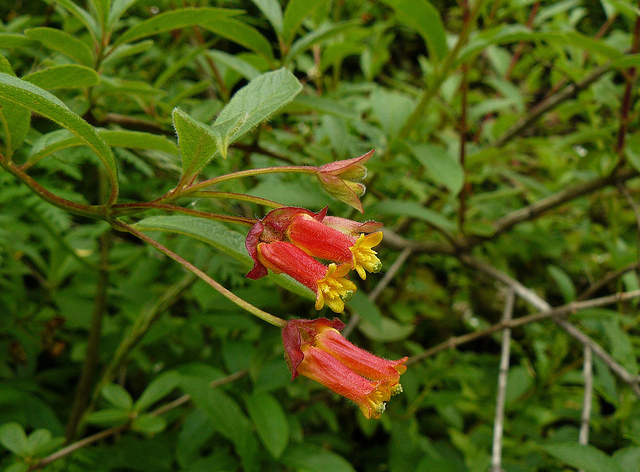 Trichomes cover the flowers and leaves of Twinberry honeysuckle (Lonicera involucrata), which grows along the coastline from Alaska all the way to Mexico. All plants have a thin waxy cuticle, but many drought-tolerant plants grow thick coatings as a barrier against the environment. Plants in limited water environments develop these coatings to help retain water by limiting transpiration. 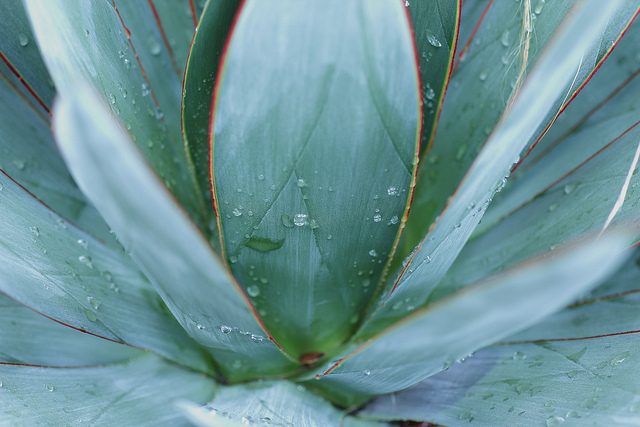 Agave plants, such as the Southern Californian desert agave (Agave deserti), have thick waxy layers on their leaves, which insulate the plant from the hot desert sun. 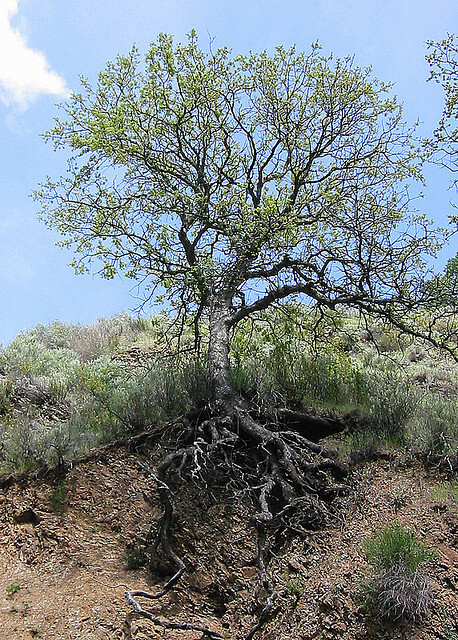 Plants native to different regions have evolved different root structures. In general, trees grow a single, wide tap root deep into the ground, which gives the tree dependable moisture. In regions with dry summers, trees also grow lateral root systems along the surface, which give the tree stability and the majority of the moisture and the nutrients it needs. The California oak tree (Quercus agrifolia) has a root system that extends as far as 90 feet beyond its branches, adapted to wet winters and long, dry summers throughout the state. 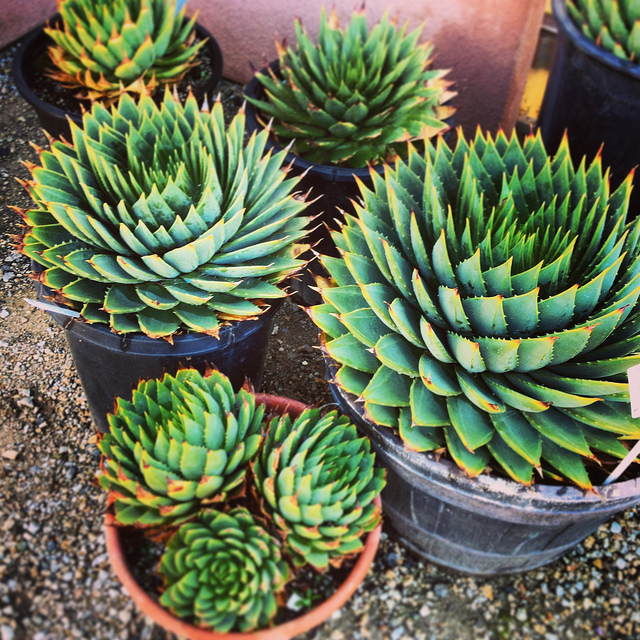 Succulents are particularly drought-tolerant. They contain tissue capable of storing water, so they can survive for short periods without water. They often have thick, fleshy leaves, like spiral aloe (Aloe polyphylla) a non-native plant that does well in regions with variable water supply, including the Bay Area. Some succulents can also store water in their stems and roots, including certain bulbs.